Microfiber cloths only require water to clean. If desired, chemical cleansers that do not contain bleach can be used in conjunction with the cloth without damaging the material. Use the cloth dry for all your dusting needs! The cloths are statically charged so they attract dirt, pet hairs, dust balls and microparticles like a magnet. Once the cloths attract dust and dirt it actually remains trapped in the grooves of the cloth itself so the particles are not just re-scattered in the air like with ordinary dusters. When a microfiber cloth becomes lightly dirty, shake it to remove loose dust and particles. You do not need to wash the cloth after every dusting--just wash the cloth when it becomes soiled or very dirty. DO NOT over wet the Microfiber Cloth! Remember, the microfibers do the actual cleaning --using a lot of water or cleanser does not make it clean better; the water or cleanser is just an aid to help the cloth lift up tough dirt and stains. Lightly mist the area or lightly dampen the cloth with water or cleanser. The microfiber cloths can be used effectively with just water, however non-toxic or chemical cleansers that do not contain bleach can be used. Before using the cloth damp for the first time, soak the cloth in HOT water for 5-10 minutes or machine wash in HOT water. This is not required in order to use the cloth effectively; however this will ensure the best possible streak and lint free surfaces. You can use just one cloth to clean and polish your entire home! Just dampen half of the cloth and keep the other half dry. Now you can dust (with the dry side) and clean and polish (with the wet side) your entire home with ease and speed! Another option...fold the cloth in half, then in half again - this way you have 8 clean sides to clean with. If you have a new cloth you haven't yet used, try using the cloth damp to wipe away filmy residue from fruits and vegetables (we recommend you only do this if you have one cloth you use solely for this purpose). To use the cloth to clean windows, glass and mirrors just lightly sprinkle the cloth with water or use a spray bottle filled with water to mist the area and proceed to clean. Or, dampen half the cloth with water, leaving the other half dry. Wipe mirrors with the damp side of the cloth, and then do a quick "wipeover" with the dry side of the cloth for the most streak-free surface possible! To remove mild spots (not stains) from carpets, rugs, sofas, furniture coverings and even clothing, take a wet cloth and blot the spot repeatedly (don't rub in) until spot is gone. Hand or machine wash the cloths in warm or hot water with detergent. Washing in hot water makes the microfibers expand releasing trapped dirt and microparticles. Air dry or tumble dry low. Do not wash with terry towels, or articles that "shed" a lot of lint. Wash with t-shirts, jeans, etc. Do NOT use bleach or fabric softeners!!! Over time, using harsh chemicals such as those contained in bleach and fabric softeners, will reduce the quality, effectiveness and longevity of your Microfiber Cloths. 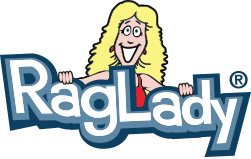 RagLady has the best Microfiber cloths!